This article was published in the European Commission’s Horizon Magazine on 12 July 2017. A Europe-wide research effort is ramping up efforts to understand the risk to EU food supplies from climate change, after a report revealed that common staples are under threat from water scarcity and drought in the developing world. The report, entitled Vulnerabilities of Europe’s economy to global water scarcity and drought revealed that supplies of animal feed, rice, cotton, grapes and even pistachios could be impacted in the near future as they come from regions that have a shortage of water. In fact, over a third of Europe’s water needs come from other parts of the world, due to imported crops. ‘Right now it is more like an alert,’ said Professor Bart van den Hurk, who coordinates the EU-funded IMPREX project, which produced the report as part of its efforts to analyse the links between climate change and water. ‘The next step is really to look at climate change sentinels (indicators) in the areas of exposure … and see whether you can actually translate climate change effects in those areas to European sensitivities,’ said Prof. van den Hurk, who works for The Royal Netherlands Meteorological Institute, the Dutch national weather service. According to the UN’s Intergovernmental Panel on Climate Change, the frequency and intensity of heatwaves and droughts will rise over the coming years as man-made climate change takes hold. Dr Ertug Ercin, the lead author of the report, said that they were surprised when they realised just how vulnerable some of Europe’s food products were. The project worked out Europe’s water vulnerability by looking at trade flows into and out of Europe, and then examining the water situation in countries from where the food originates. Analysing water demand is part of a broader effort by the IMPREX project to encourage public officials and businesses to take climate change forecasts into account when making decisions by predicting how global warming will lead to extreme weather in Europe. It’s in part driven by a personal commitment by Prof. van den Hurk to help people make better use of climate forecasts, where computer models can use satellite and ground measurements to extrapolate how climate change will affect us. ‘I’m really on a mission to embed this physical climate science further down the chain,’ he said. 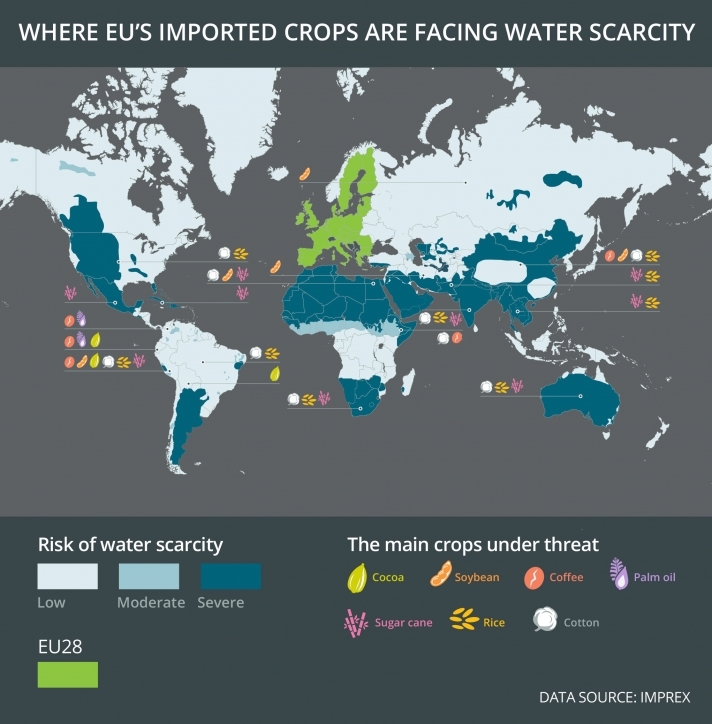 The EU imports crops from all over the world with some of them facing drought and water scarcity.